BikeCommuters.com > advocacy > Make it count! Yesterday morning during my commute down Lincoln Avenue in Chicago I came upon two lovely tubes across my path. Recently – due to lots of construction along this Lincoln Ave route – I’ve been detouring to the Lakefront Path, but I’m glad I took the route down Lincoln on Monday. I counted! CDOT needs the stats as it plans to add even more marked shared lanes and bike lanes in the city. As you can see, the tubes are similar to the the ones used for counting cars, but on a smaller scale that bicycle wheels easily roll over. So… if you see these in your path – do not veer around them. In fact, you’re encouraged to roll on over these tubes and be counted. A box set off to the side of the road gathers the stats over a period of 24-hours. Then last night I attended the Active Transportation Alliance‘s annual member meeting where Pedal Power: The Quiet Rise of the Bicycle in American Public Life author Professor Harry Wray spoke about the important role of bicycles in forming community. He mentioned that right now 1% of trips in Chicago are by bike, and offered encouragement of the cultural shift away from they hyper-individualism that’s swept our society these past 30 years toward the more common interest of connecting our neighborhoods. “We connect to each other differently when we’re on a bike,” Wray said. His address lead perfectly into a showing of a video featuring NYC’s Summer Streets, Portland’s Sunday Parkways, San Francisco’s Sunday Streets and Chicago’s Open Streets. After Wray’s energizing talk, Mayor Richard M. Daley took the podium. 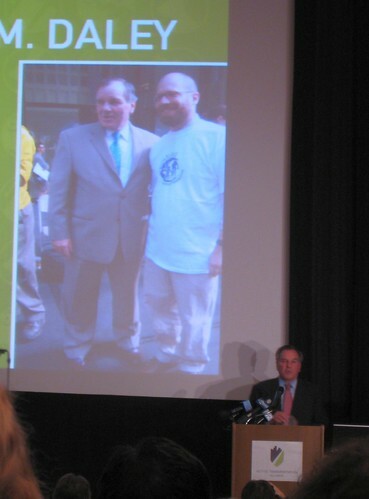 Mayor Daley assured members that he’s still actively working toward the goals of Chicago’s Bike 2015 Plan. He just returned from a trip to Copenhagen where he saw first hand what great bike infrastructure can be. He urges all of us to speak with our state and national legislators and local aldermen to educate our representatives and get their support for the necessary infrastructure to make complete streets and dedicated bike lanes a reality. He also praised Chicago’s visionary planners for keeping our lakefront protected from development, since not even Copenhagen cyclists have much access to their lakefront. We bike commuters have a voice, and our commutes do count. Elizabeth, you should go around the block a few times and keep hittin’ those pneumatic tubes. Make ’em think there are a LOT of bikes in the area!!! Or … since they have the tubes placed in both directions, I could have just ridden loops on the road — riding up and down over the tubes on the northbound and southbound bike lanes. But — I didn’t. Too bad my commute home from the meeting was along the lake and my fellow riding buddies and I didn’t get counted after the meeting. I also attended the ATA meeting. Mayor Daley talks a good talk. I look forward to a better cycling environment in Chicago. I noticed that Dottie from Let’s Go Ride A Bike was there, too, so I guess the bloggers were representing. Where are they on Lincoln? @Wild Bill, glad you made it last night. Yes, the bloggers were representing. 🙂 Will you be advocating as the Mayor suggests to your local/state/national officials? I think getting our voices heard is step #1 toward that better cycling environment – everywhere. 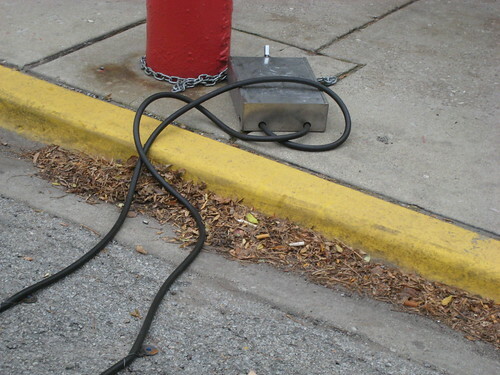 Yesterday the tubes were on Lincoln (just north of Armitage). 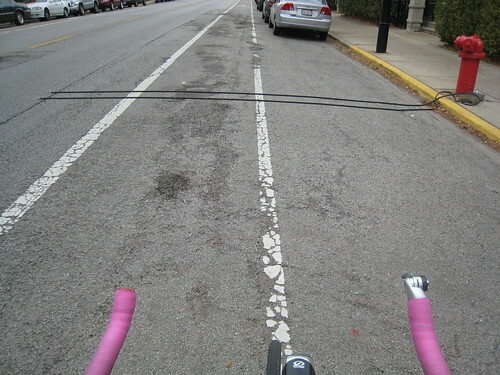 Today I rolled over them in the southbound bike lane on Wells. I saw the tubes on my way home from the ATA meeting last night and got pretty excited! It was the first time I’d ever seen a bike counter. It seemed like a fitting end to the night, too. Good data always helps put the hearsay in perspective. Thanks for the post! I’ll definitely keep an eye out for the tubes. Wow. An administration that actually cares about cycling? To the point of trying to assess the number of riders on a particular route? Mamma mia we are so behind here in the Old World… (ok, the Med). Great write-up! 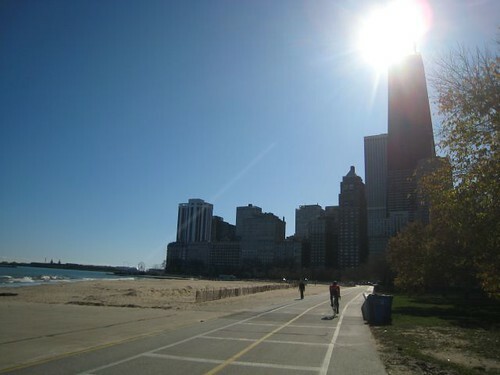 I’m sad that I’ve been riding the lakefront this week, and thus have missed all this tube fun. I am concerned that many cyclists will veer around them. Hmm. 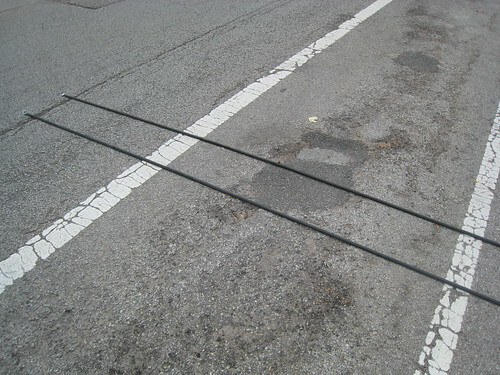 Thanks for the update – I’ve been running over them every morning and didn’t realize it was for a bicycle study. Awesome. 1) bike lanes are physically separated from auto lanes. Since Mayor Mumbles has been to Copenhagen, he no doubt seen how bike lanes are nearest to the sidewalk, with a median between them and parked cars and THEN traffic. The fact that bikers in Chicago have to worry about getting nailed by moving traffic *and* getting doored puts a serious obstacle in the way of the average person riding from the north side to the loop for work. Most just are not going to risk it. 2) Bike lanes in Copenhagen also have their own signals, WHICH PEOPLE OBEY. Now, I know that lots of bikers will claim they follow the rules of the road, but face it, the VAST majority do not, blowing through busy 4 way stops, moving in between cars in an unsafe manner, riding through red lights, etc, etc .. If you stood at Damen & Wabansia for 6 hrs and counted the number of people who *really* stopped at that 4-way intersection, you wouldn’t use both hands. Face it – if Chicago had as many bikers (or 1/10th the number, even) as CPH and people still rode like they do now, there would be dozens of traffic deaths every year. And I’m not just talking about crazy messengers, either. That bike counter is fabulous. We’d be interested in doing the same here in Boston. Do you have a contact at CDOT that could steer us in the right direction? @Brian – Josh Koonce from the CDOT Bicycle Program reported on the counts at the September Mayor’s Bike Advisory Council meeting. They got a website: http://www.chicagobikes.org/ and a page of staff.